Super simple Saturday night meal. Chicken and beef kebabs on the kamado joe. A handful of button mushrooms stem removed and halved. Add the diced chicken, 1/2 minced garlic, light soy sauce and Lanes Garlic BBQ Garlic² rub to a bowl and combine well cover and refrigerate for at least 1/2 hr, longer if possible. Add the diced beef, 1/2 minced garlic, splash light soy sauce and dash of the rubs to a bowl, combine well cover and refrigerate for at least 1/2 hr, longer if possible. Time to assemble the kebabs. Take a pre-soaked bamboo skewer and slide on your ingredients alternating veggie/meat/veggie/meat/veggie etc. until you have around 10 pieces loaded then repeat until all ingredients are used. There is no hard and fast rule, make it colourful and fun. 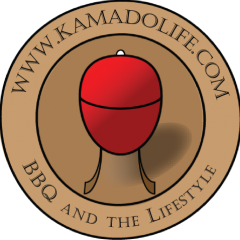 While preparing your ingredients, light the Kamado and set it up for direct grilling with your grill rack in the upper position. For Kebabs aim to have a dome temperature around 250ºc. Don’t be too concerned if it is a little over or under as this we are using the direct method. I chose to cook the chicken kebabs on the cast iron plate as I didn’t want the chicken to stick to the grill and fall apart. Once they were 99% cooked I removed the cast iron plate and finished them direct on the grill. Once all the chicken kebabs were cooked it was time for the beef kebabs to meet the grill. I did the beef ones directly on the grill as I wasn’t worried about them falling apart or sticking and really wanted that nice char on them. The time to cook is going to depend on how large you make your pieces and what your final grill temperature is at. I relied on sampling the largest piece and checking for doneness. Well, the chicken ones were gone before the beef ones came off the grill. That gotta be a good testament to how they tasted, even my 4 year old loved them. Will definitely be a regular menu item in this household.